A crowd convenes on the cathedral’s front steps on Easter Sunday, April 1. There is no more hopeful place than Easter Sunday Mass,” Cardinal Dolan said in his homily at the 10:15 a.m. liturgy he celebrated April 1 at St. Patrick’s Cathedral. The cardinal recalled the heart-rending Funeral Mass of FDNY Lieutenant Michael R. Davidson that he offered at the cathedral March 27. Davidson, 37, a 15-year veteran of the FDNY, died March 23 after battling a five-alarm fire in Harlem. He is survived by his wife, Eileen, and their four young children. 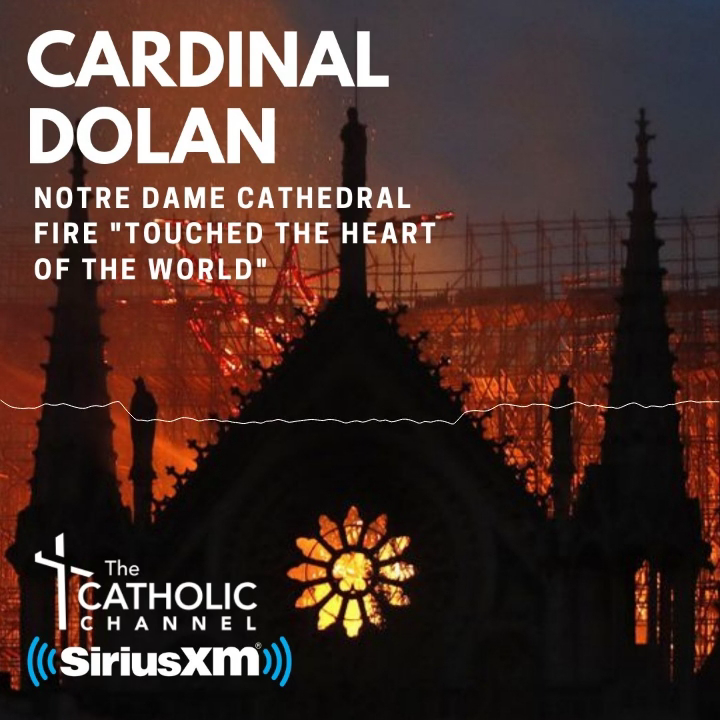 “Last week, here in New York and here at St. Patrick’s Cathedral, we had two Good Fridays, not just one,” Cardinal Dolan said. In addition to the actual Good Friday, which commemorates Jesus’ crucifixion and death on the cross, he was referring to Tuesday of Holy Week, the day of Davidson’s Funeral Mass. “Folks, take my word for it, that Funeral Mass was Good Friday. Like that first Good Friday, the darkness was thick…the floors of this cathedral seemed to tremble with an earthquake of sadness,” the cardinal said. After the homily, the cardinal asked the faithful to renew their baptismal promises, as is customary on Easter Sunday. In doing so, they united with the more than 1,000 who were baptized into the faith and received the other sacraments of initiation (confirmation and Holy Communion) at the Easter Vigil in parishes across the archdiocese. Cardinal Dolan and the principal concelebrants, Auxiliary Bishop John O’Hara and Msgr. Robert Ritchie, the cathedral rector, then processed up and down the aisles of the cathedral’s nave to sprinkle holy water upon the congregation. Davidson was remembered again in the Prayer of the Faithful, as was Rusty Staub, the former New York Mets outfielder who died March 29, opening day of the baseball season. The cardinal acknowledged Staub for his goodness to the Archdiocese of New York and to archdiocesan Catholic Charities. Cardinal Dolan’s late father was also remembered, as the day marked the 41th anniversary of Robert Dolan’s death. The Greg and Kathleen Hanson family of St. Mary’s parish in Spokane Valley, Wash., came to New York for the first time for spring break and Easter. Accompanying Greg and Kathleen were their son Carter, 20, and daughters Amanda, 18 and Grace, 16.